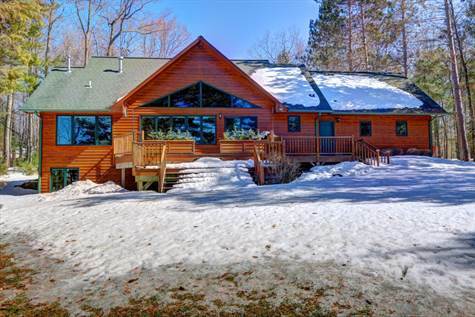 Immaculate home on beautiful Middle Eau Claire Lake. This custom built home was well designed and built with high quality materials and finishes throughout; granite countertops, custom cabinetry, stainless steel appliances, triple pane windows, walk-in pantry, main floor master bedroom w/lake view, central air-conditioning, basement in-floor heat and so much more. Highly desirable location and lot featuring a gorgeous setting among large pine trees, western exposure for spectacular sunsets, level yard with moderate elevation to the lake and hard sand lake bottom. 2 car attached garage, 2 car detached garage, plus a 26'x36' insulated/heated building which was used as a workshop, however, the possibilities are many including bunk house. Dock and boat lift included. This is the complete package, come take a look, you'll be impressed.